Morphogenesis was formed in 1985 by a group of people (Adam Bohman, Ron Briefel, Clive Graham, Clive Hall, Michael Prime, Roger Sutherland (RIP)) interested in exploring the possibilities of live electronic music and collective improvisation. The groups aim is to unify and integrate many diverse sound elements, (electronic, vocal, instrumental and environmental) within a context of continual evolution and group dialogue. In addition to using adapted or prepared conventional instruments – usually violin, piano and acoustic guitar they also construct their own instruments. The range of sounds are further extended by means of filtering and other forms of signal processing. Contact microphones are used to amplify the sounds of bubbling water and other small sounds. All these acoustic sounds are enhanced by electronic filtering etc. The group also uses a bioactivity translator developed by Michael Prime which is used to measure the voltage potential of living organisms – including plants, fungi, and the human nervous system – and translate the biological rhythms into electronic sound. Other electronic instruments include a 4 speed portable reel to reel tape recorder and a multi speed CD player, both of which are used to work with short sound samples. The overall effect is an adventurous voyage in an everchanging cosmos of acoustic and electronic sound treatments in the tradition of the first generation of group improvisation with live electronics like K.H. Stockhausen or MEV. Besides Morphogenesis most members have worked in a variety of musical activities outside of the group. Adam Bohman has participated in numerous improvised music collectives, released several solo works and teams with his brother Jonathan as the Bohman Brothers. Ron Briefel taught music technology for 20 years and was responsible for the early studio recordings. Clive Graham has worked with Nurse With Wound in the 80’s and started his CD label Paradigm Discs and had a weekly radio program. Michael Prime‘s has been releasing his solo work on his label Mycophile since the late 80’s. He has also been working with a.o. Organum, Jim ‘O Rourke, Eddie Prevost and formed the duo Negative Entropy with Geert Feytons. Roger Sutherland was involved in Cornelius Cardew’s Scratch Orchestra in the 60’s, wrote numerous articles on new music and a book ‘New Perspectives in Music’ . 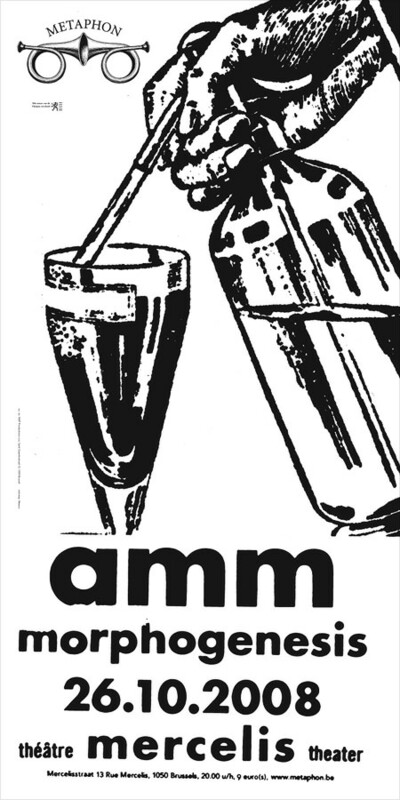 AMM is a British free improvisation group founded in London, 1965. Initially AMM was composed of Keith Rowe on guitar, Lou Gare on saxophone and Eddie Prévost on drums. They all had a background in the UK jazz scene and shared a common interest in exploring music beyond the boundaries of formal systems or limitations. In addition to amplifying their instruments they also used contact microphones to amplify the sounds made by various common objects. In early 1966 AMM released their first album, AMMusic on Electra Records UK, a landmark recording in music history. On this album the trio was joined by members Lawrence Sheaff on cello and accordeon and by composer/ Stockhausen student Cornelius Cardew on piano, cello and transistor radio. The overall sound of the group, even in 1966, was so different, so idiosyncratic, that it’s not at all surprising that both new jazz and contemporary classical audiences were baffled, if not horrified. Their 2nd release ‘The Crypt sessions’ from 1968 (only released in the early 80’s) , where Sheaff was replaced by percussionist Christopher Hobbs, was arguably even more important in establishing the droning, long-form music that would come to characterize AMM being further “out” and even less conventional than earlier material. No AMM performance is ever planned; each is unique and spontaneous. The musicians vowed never to rehearse and never to discuss what they had played and tend to avoid any conventional melody, harmony or rhythm, and seek out an ensemble sound that often obscures any individual’s role. Throughout the 70’s the group was less active due to personal changes until pianist John Tilbury – previously an occasional AMM collaborator – joined in about 1980. His shimmering Feldmanesque playing brought a measure of conventionality to AMM (relatively speaking); unlike Rowe or Prévost, Tilbury’s instrument was nearly always recognizable in conventional terms. This version of AMM generally explored quieter, more meditative sounds, perhaps having more in common with minimalism — though they could generate a cacophonous racket when so inclined. Since about 2000 Rowe left the group and Prévost and Tilbury continue to record and perform as AMM, sometimes with guests as Evan Parker, Christian Wolff or David Jackman. Most of the AMM recordings have been released on Matchless Recordings, run by Eddie Prévost. Along with like minded formations of live improvised electr(on)ic music in Europe like MEV and Nuova Consonanza, AMM are considered as being the most radical. They have been called legendary and groundbreaking and are notable as perhaps the first musical group deliberately to try to make music not related to any established musical genre. Although not well-known to the general public they have been hugely influential on several generations of adventurous and sometimes well-known musicians including Stockhausen, Frank Zappa, Pink Floyd and even the Beatles.